Members adverts are FREE – go to Step 2 below! Maximum 500 words – Text is mandatory – we do not accept just photographs or PDF files. 1 Company Logo (Minimum size: 250px x 250px) – optional. Maximum of 2 Photos for your event. (We only accept .png or .jpg or .gif files for photos on the page – Minimum 960px wide. Maximum file size: 256kb each). Please make sure that you own the copyright to these photographs. You must provide a subject or title for the advert i.e. the main heading. Your email MUST contain the following typed text so that we can copy and paste it: Subject / Title of event, Date, Time, FULL address of Venue (for Google maps), Organiser Name, Organiser email address. We do not accept only PDF documents or Powerpoint files instead of typed text. Up to 2 photographs and 1 logo can be included on the page. Divide your text into sections with sub-headings, bullet lists, and short paragraphs to make it easy to read. Don’t hard sell, try to provide some value-added information as well as just trying to punt your product or service. Please proofread/spellcheck all your own text. We do not do ANY corrections on your behalf. Provide a URL link to your own website or to a Social Media page or your main target page for your promotion. Make sure that your phone number(s) AND address are correct. There is nothing more irritating than an advert with only a cell number and NO address or town/suburb. You can provide GPS co-ordinates to your premises if required as part of the venue address. Our design team will code and lay out the calendar advert page using the information, logo and photos – included in advert fee. 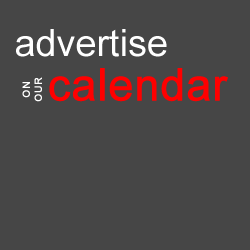 We will notify you when the advert has been published on the calendar. STEP 1: Payment process for NON-MEMBERS ONLY. Members adverts are free – go to Step 2! Type the following details accurately: Subject / Title of event, Date, Time, FULL address of Venue (for Google maps), GPS Co-ordinates if required, Organiser Name, Organiser email address. Attach your logo / photos to the email. We only accept .png or .jpg or .gif files for photos on the page – Minimum 960px wide. Maximum file size: 256kb each. Please carefully check the calendar advert and immediately report any problems or errors. If we do not hear from you within 2 working days after publishing, we will presume that you have accepted the advert as being correct in all respects. Full page advertorial - with lifetime exposure on the website. Excellent for SEO. 2 Photos in jpg or png format - not smaller than 960px wide.